Over the past week, Republican presidential nominee Donald Trump has twisted the facts on illegal immigration, and the plans of his opponent, Hillary Clinton, as he struggled to explain what he would do with the estimated 11 million people who are living in the U.S. illegally. Trump was wrong in saying that “using the existing laws, millions of people are deported every year.” The peak for removals based on deportation orders dating to 1892 was 435,498 in fiscal 2013. Trump wrongly said “nearly 200,000 illegal immigrants” booked into Texas jails “were responsible for more than half a million criminal offenses.” State data show 130,000 were arrested over a five-year period, and their convictions, over their lifetimes, totaled 157,000. Trump said that “nobody even knows” if there are 11 million immigrants in the country illegally, adding that the number could be 30 million or 5 million. But several independent estimates agree on the 11 million number, and experts say it’s impossible for the number to be as high, or as low, as Trump says. Trump exaggerated when he said Clinton will “close down detention centers for border crossings, meaning she will have an open southern border that will bring … crime and destruction.” Clinton has said she would replace privately run centers with government-run facilities. Trump claimed Clinton’s immigration plan “would functionally end enforcement of visa overstay rules — another open border decree.” But her plan does not address visa overstays. To the contrary, Clinton supported a 2013 Senate bill that included a provision to create a new system to track, locate and remove visa overstays. Trump came under criticism even from some of his supporters when he appeared to soften his position on deporting all 11 million or so people who are estimated to be living in the U.S. illegally. Trump told Fox News’ Sean Hannity on Aug. 24 (at about the 3:40 mark) that “everyone agrees that we get the bad ones out,” but then he left open the possibility that some who have been living in the U.S. for years without incident would get to stay. “They’ll pay back taxes, they have to pay taxes. There’s no amnesty, as such, there’s no amnesty, but we work with them,” Trump told Hannity, contrary to his earlier position that he would have a “deportation force” to remove all 11 million people. Trump may clear up the confusion in a speech he said he will deliver Aug. 31. As he dealt with the deportation issue in recent days, Trump gave several speeches and interviews that touched on the topic of immigration. We review some of his claims here. Trump told CNN’s Anderson Cooper in an Aug. 25 interview that “using the existing laws, millions of people are deported every year.” That’s false, and not even close. DHS defines a “removal” as “the compulsory and confirmed movement of an inadmissible or deportable alien out of the United States based on an order of removal.” The peak for removals processed by the Customs and Border Protection and Immigration and Customs Enforcement agencies, going back to 1892, was 435,498 in fiscal 2013. Trump may have been thinking of a time when the total number of “removals” and “returns,” together, approached 2 million. That was more than a decade ago, though. The peak for returns was nearly 1.7 million in fiscal 2000, and there were an additional 188,467 removals that year. 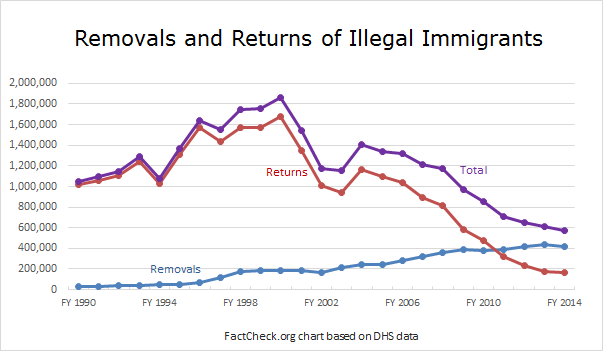 But the last time DHS reported more than even 1 million combined removals and returns was fiscal 2008. And DHS conducted a total of just 462,463 removals and returns in fiscal 2015. At a campaign rally in Austin, Trump took a page out of former Texas Gov. Rick Perry’s playbook and misrepresented Texas crime data on immigrants. Trump claimed the numbers pertained to “illegal immigrants,” but they actually pertain to all immigrants, both legal and illegal. Trump, Aug. 23: According to the Texas government, nearly 200,000 illegal immigrants were booked into Texas jails between 2011 and 2016. Collectively, those arrested were responsible for more than half a million criminal offenses, including 1,055 homicides, 5,516 sexual assault charges and more than 50,000 charges of either burglary or theft. Not going to happen folks. We’re not going to let it happen to our country. It’s enough. Trump is citing, incorrectly, figures from the Texas Department of Public Safety, which has a webpage on “Texas Criminal Alien Arrest Data.” Just as Perry did when he cited such data in 2014, Trump says the statistics are about illegal immigrants. But a “criminal alien,” in the Texas DPS’ wording, is any immigrant who was charged with a crime — and the webpage, which contains all of the numbers Trump used, makes that clear. Also, the “more than half a million criminal offenses” Trump cites are charges, not convictions, over those immigrants’ lifetimes. Trump goes on to say that the immigrants arrested between 2011 and 2016 “were responsible for more than half a million criminal offenses,” including homicides and sexual assaults — but these are arrests, not convictions. Also, the Texas DPS notes these arrests occurred “[d]uring their criminal careers.” So the number of offenses goes beyond the 2011-2016 time frame. The DPS doesn’t give a breakdown for the number of those charges for illegal and legal immigrants, and DPS spokesman Tom Vinger told us that information wasn’t readily available and would require a public information request. We have submitted that request and will update this article if we obtain those numbers. This means the numbers that Trump gives for homicide, sexual assault and burglary/theft charges don’t all pertain to immigrants living in the country illegally, as he claims. These charges or arrests of immigrants are more than double the number of convictions. The Texas DPS webpage says that while there have been 526,000 arrests, over the “criminal careers” of these individuals, there have been “over 236,000 convictions” resulting from those charges. DPS does have a breakdown for how many convictions pertain to immigrants in the country illegally: 157,000. So, the 130,000 individuals arrested between 2011 and 2016 in Texas — who were identified by fingerprints by the Department of Homeland Security as being illegally present in the country — were convicted of 157,000 crimes over their lifetimes in Texas. We also have requested a breakdown on the types of convictions for illegal and legal immigrants. The Texas DPS notes: “Texas arrestees who have not had interaction with the DHS which resulted in the collection of fingerprints are not included as their identity cannot be biometrically verified by DHS.” So there may be more immigrants, of varying legal status, who were arrested in Texas but not included in these figures. How Many Are Here Illegally? Trump told Cooper that there could be as many as 30 million immigrants living in the U.S. illegally. But immigration experts say that it is impossible for the number to be that high. Trump: You know it’s a process. You can’t take 11 million at one time and just say boom, you’re gone. We have to find where these people are. Most people don’t even know — nobody even knows if it’s 11 [million]. It could be 30 [million] and it could be 5 [million]. Nobody knows what the number is. However, the old federal number is in line with more recent estimates from independent immigration groups. The Center for Migration Studies, a think tank that studies international migration, estimated that the illegal population was about 10.9 million as of 2014. Similarly, the nonpartisan Pew Research Center, based on preliminary figures, estimated that there were 11.3 million unauthorized immigrants living in the U.S. that year. Both CMS and Pew, as well as the federal government, estimated the size of the unauthorized population by subtracting the number of legal immigrants in the U.S from the total foreign-born population in the U.S., and then adding the estimated number of foreign-born individuals missed by the Census Bureau’s population survey. “Several nongovernmental organizations and the federal government, each using their own methodologies to estimate the unauthorized population in the United States and taking into account the fact that there is an undercount of unauthorized immigrants in U.S. Census Bureau data, have developed very similar numbers,” wrote Michelle Mittelstadt, director of communications and public affairs at the Migration Policy Institute, in an email to FactCheck.org. “So, we believe that these estimates are largely accurate, even as there are differences of up to a few hundred thousand people among these estimates,” Mittelstadt said. Therefore, immigration experts said, it’s not possible that there could be as many as 30 million illegal immigrants in the U.S., as Trump suggested. “We believe that our estimates are sound estimates of the population,” said Jeffrey Passel, a senior demographer at the Pew Research Center. In an email, Passel told us that the number of unauthorized immigrants could be “a million or so higher” than 11 million. But, he said, it is “virtually impossible” for that population to be as low as 5 million and “simply no way” that it could be as high as 30 million. Passel, Aug. 30: Based on data collected in our surveys, US government surveys and many others, it is virtually impossible for there to be as few as 5 million unauthorized immigrants in the country. On the high side, there could be more than 11 million, but it’s extremely unlikely that the number could be more than a million or so higher. We base this assessment on a number of factors including: the number of housing units in the country (there’s simply no place for an additional 20 million folks to live); the population of Mexico and Central America (based on their own censuses and surveys, there could not be another 5+ million people missing); and data on visa admissions & departures (virtually all who arrive are known to depart). There’s simply no way for an additional 20 million people (30 million less the 11 estimated) to be in the country and have escaped detection. Steven Camarota, director of research at the Center for Immigration Studies, which favors fewer legal immigration admissions to the U.S., estimated the population of illegal immigrants to be 11.5 million in 2015 and 11.7 million in 2016. That’s in the range of 10 million to 12 million that “most people believe,” Camarota said in an interview. “There is not good evidence” that the number is a lot higher, he said. In his Iowa speech, Trump criticized several aspects of Clinton’s immigration plan. Trump, Aug. 27: Hillary Clinton’s legislative plan, remember this, is to give illegal immigrants access to Obamacare, Social Security, Medicare and U.S. welfare. I can see one man that doesn’t like that very much. That would not happen here, would it? Her plan would functionally end enforcement of visa overstay rules — another open border decree. She’ll also close down detention centers for border crossings, meaning she will have an open southern border that will bring nothing but crime and destruction. Trump is right that Clinton has proposed “to give illegal immigrants access to Obamacare.” Clinton’s immigration plan says that “[w]e should let families — regardless of immigration status — buy into the Affordable Care Act exchanges.” Her plan does not, however, “give illegal immigrants access” to other government programs such as Social Security unless and until they become legal residents, as we have addressed before. But what about detention centers and visa overstays? Clinton’s plan does not address visa overstays. Her only mention of visas in her plan is a promise to “fix the family visa backlog,” a reference to administrative delays for processing visa applications for spouses, children and parents of U.S. citizens, as well as the cap on family visas for other family members, as explained by the National Immigration Forum, a pro-immigration advocacy group. As of Nov. 1, 2015, there were 4.5 million family-sponsored visa applicants on the waiting list, according to the State Department. Clinton reiterated her pledge to address the backlog in a July speech at the 87th League of United Latin American Citizens conference. It’s not known how many of the estimated 11.3 million people now living in the U.S. illegally overstayed their visas, but the number is believed to be in the millions. In 2006, the Pew Research Center estimated that there were 11.5 million to 12 million people living illegally in the U.S. at that time, and somewhere between 4 million to 5.5 million of them had overstayed their visas. More recently, the Department of Homeland Security reported that 527,127 individuals overstayed their visas in fiscal year 2015. While Clinton’s plan doesn’t specifically address visa overstays, Clinton’s plan does call for comprehensive immigration legislation that includes a path to citizenship. That means that some of those who overstayed their visas may be eligible to legally stay in the U.S. It is possible that that is what Trump means when he says her plan “would functionally end enforcement of visa overstay rules.” We asked the campaign for a clarification, but we did not receive one. Even so, Trump overstates his case because the visa overstay rules likely would remain in effect for those not eligible for Clinton’s immigration plan or whatever version of it she may be able to enact as president. In fact, Clinton endorsed the Senate’s bipartisan immigration bill — the Border Security, Economic Opportunity and Immigration Modernization Act of 2013 — that had a provision specific to visa overstays. That bill would have imposed a new exit-tracking system of visa holders to reduce visa overstays, and “locate and remove visa overstays identified by the entry-exit system,” as explained in a 2014 report by the nonpartisan Congressional Research Service. Clinton, Dec. 14: There are people in immigration detention right now who are on a hunger strike. We need to be focused on detention conditions, and as president I’ll close private immigration detention centers. This is a critical government responsibility and we should not be outsourcing it to anyone else. I’ll also end family detention, we have good alternatives and we should use them. While Clinton is not getting rid of all detention centers, as implied by Trump, she may need fewer detention centers since she promises to “end family detention” centers and use alternatives. The Clinton campaign did not respond when we asked what alternatives she is proposing. But the Department of Homeland Security has an existing Alternative to Detention program for low-risk detainees that includes electronic monitoring, curfew and home visits. Families are already a relatively small portion of the overall immigration detainee population. As of Aug. 8, there was a nationwide average daily population of 33,676 in detention centers, according to a spokeswoman for U.S. Immigration and Customs Enforcement. Prior to 2014, the Department of Homeland Security, which includes ICE, had only 95 of its 34,000 beds available for families, Homeland Security Secretary Jeh Johnson said in a speech at Rice University on June 8, 2015. But Johnson said the surge of immigrants from Central America required the department to build more capacity. As a result, the department opened a 532-bed facility for families in Karnes, Texas, and a 2,400-bed facility in Dilley, Texas. So Clinton’s promise to “end family detention” will have a limited impact on the overall detainee population, while her promise to “close private immigration detention centers” would result in a switch to government-run facilities. It does not mean that Clinton “will have an open southern border,” as Trump claimed. Christie, Aug. 28: Hillary Clinton has a 100-day amnesty plan, where everybody here, no matter whether you’ve been a criminal or not, no matter how you got here or not, is going to wind up becoming American citizens under Hillary Clinton’s plan. Christie’s false claim echoes a recent Trump TV ad, which gave a misleading comparison of how criminals would be treated under the presidential candidates’ plans. In fact, Trump, on Aug. 22, said he’d “get rid of all of the bad ones,” including “gang members” and “killers.” He went on to talk about using the existing deportation process for others. “Anderson Cooper 360°.” Transcript. 25 Aug 2016. Simanski, John. “Immigration Enforcement Actions: 2013.” U.S. Department of Homeland Security Office of Immigration Statistics. Sep 2014. U.S. Department of Homeland Security Office of Immigration Statistics. 2014 Yearbook of Immigration Statistics. Table 39. August 2016. U.S. Department of Homeland Security. “DHS Releases End of Fiscal Year 2015 Statistics.” News release. 22 Dec 2015. Passel, Jeffrey, senior demographer at the Pew Research Center. Email interview with FactCheck.org. 30 Aug 2016. Camarota, Steven, director of research at the Center for Immigration Studies. Telephone interview with FactCheck.org. 30 Aug 2016. Mittelstadt, Michelle, director of communications and public affairs at the Migration Policy Institute. Email interview with FactCheck.org. 30 Aug 2016. Warren, Robert. “US Undocumented Population Drops Below 11 Million in 2014, with Continued Declines in the Mexican Undocumented Population.” Journal on Migration and Human Society. Vol 4, No 1 (2016). Passel, Jeffrey and Cohn, D’Vera. “Unauthorized immigrant population stable for half a decade.” Pew Research Center. 22 July 2015. Camarota, Steven. “New Data: Immigration Surged in 2014 and 2015.” Center for Immigration Studies. Jun 2016. Warren, Robert. “The Estimated Undocumented Population 11 Million: How Do We Know?” Center for Migration Studies. 8 Sep 2015. Texas Department of Public Safety. “Texas Criminal Alien Arrest Data.” accessed 30 Aug 2016. Vinger, Tom, press secretary, Texas Department of Public Safety. Email to FactCheck.org. 26 Aug 2016. “This Week” transcript. ABC News. 28 Aug 2016. Clinton, Hillary. Immigration reform. hillaryclinton.com. accessed 30 Aug 2016. “Transcript: The Post-Univision Democratic debate, annotated.” Washington Post. 9 Mar 2016. Clinton, Hillary. “Remarks on plan to strengthen immigrant families at the National Immigrant Integration Conference in Brooklyn.” hillaryclinton.com. 9 Dec 2015. posted 31 Jan 2016. S.744. “Border Security, Economic Opportunity, and Immigration Modernization Act.” Congress.gov. accessed 30 Aug 2016. Haberman, Maggie and Michael D. Shear. “Donald Trump, Wavering on Immigration, Finds Anger in All Corners.” New York Times. 25 Aug 2016. Blake, Aaron. “Ann Coulter’s Donald Trump hagiography was very poorly timed.” Washington Post. 25 Aug 2016. “Trump says government can ‘work with’ illegal immigrants.” Fox News. 25 Aug 2016. Key, Pam. “Donald Trump: We Will Have a ‘Deportation Force.’” Breitbart.com. 11 Nov 2015. Robertson, Lori. “Twisting Clinton’s Immigration Plan.” 23 Aug 2016. “Donald Trump Campaign Speech in Des Moines.” C-Span. 27 Aug 2016. “Immigration Backlogs Are Separating American Families.” National Immigration Forum. 26 June 2012. “Annual Report of Immigrant Visa Applicants in the Family-sponsored and Employment-based preferences Registered at the National Visa Center as of November 1, 2015.” State Department. Undated. Accessed 30 Aug 2016. “At LULAC, Clinton Doubles Down on Expanding the President’s Executive Actions on Immigration.” Press release. Hillary for America. Undated. Accessed 30 Aug 2016. “Modes of Entry for the Unauthorized Migrant Population.” Fact sheet. Pew Research Center Hispanic Trends. 22 May 2006. “DHS Releases Entry/Exit Overstay Report For Fiscal Year 2015.” Press release. Department of Homeland Security. 19 Jan 2016. Congressional Research Service. “Immigration Legislation and Issues in the 113th Congress.” 4 Nov 2014. Lemire, Jonathan. “Clinton outlines immigration reform plan.” Associated Press. 14 Dec 2015. “Statement by Secretary Jeh C. Johnson on Establishing a Review Of Privatized Immigration Detention.” Press release. Department of Homeland Security. 29 Aug 2016. Edwards, Julia. “U.S. to review use of private immigration prisons, shares slide.” Reuters. 29 Aug 2016. John Roth, inspector general for Department of Homeland Security. Letter to Secretary Jeh C. Johnson. 16 Jun 2016. Jeh Charles Johnson, secretary of Department of Homeland Security. “Remarks by Secretary of Homeland Security Jeh Charles Johnson on “Immigration: Perception versus Reality” at Rice University – As Delivered.” 8 Jun 2015. “South Texas ICE Detention Facility to House Adults With Children.” Press release. Department of Homeland Security. 31 Jul 2014. “Statement by Secretary Johnson Regarding Today’s Trip to Texas.” Press release. Department of Homeland Security. 15 Dec 2014.